Preheat Oven at 190 degrees C.
Beat butter, sugar and salt together in a bowl until creamy. Mix in remaining ingredients and work by hand to ensure all ingredients are thoroughly mixed. Squeeze mixture together until you have a mound of dough. Cover and leave to rest in fridge for 30 minutes. Lay dough on a piece of greaseproof paper and lay another sheet on top. Press down by hand and roll to a 1.5 thickness with a rolling-pin. Cut out cookie shapes and lay on a baking tray lined with more greaseproof paper. Use palate knife to move the cookies. Once first cutting has been done, reform dough with hands and repeat rolling / cutting process until you have used all of your dough. Bake at 190 degrees C. until golden (about 15 minutes). 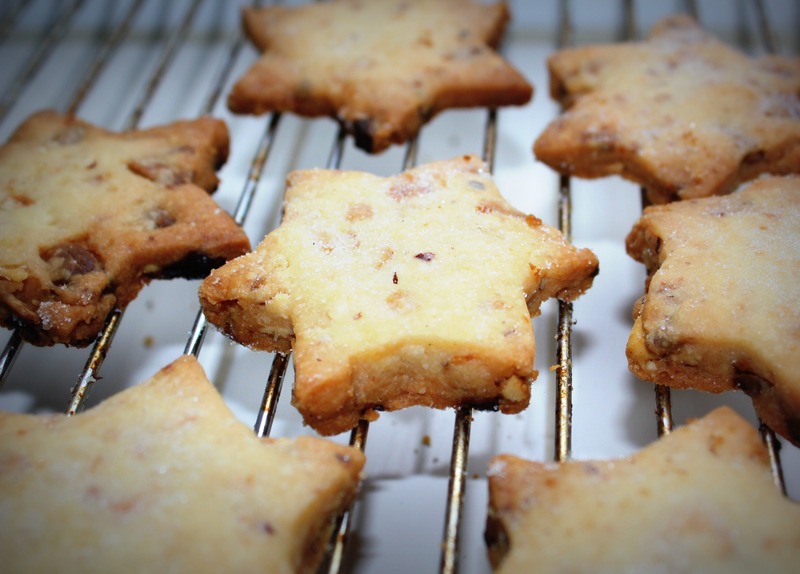 Sprinkle with a little caster sugar when cookies are fresh out of the oven. Leave to cool on a rack before eating, and store in a tin.